Saturday the sun was shining, the birds were singing and the frogs were croaking and my heart was soaring. The signs of spring brought such joy to my heart that I was in such a wonderful mood I wanted to bless everyone around me. 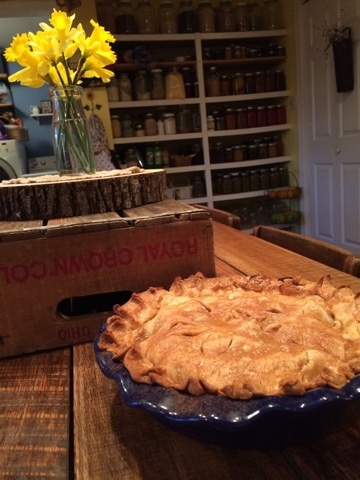 After finishing up all the other things we had to tend to that morning, I decided Saturday afternoon that I would make a pie to go with our chicken n dumplins! 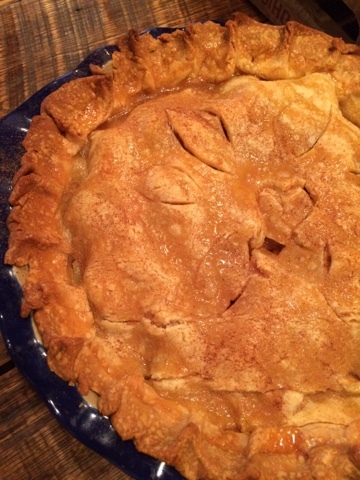 To me, there really is no other pie but apple. I know my family enjoys many different pies. 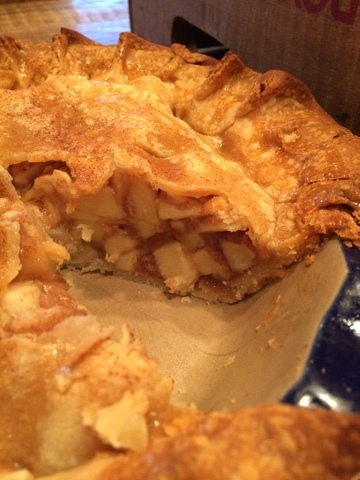 Apple pie was what I had on my mind and so that is the direction I went. 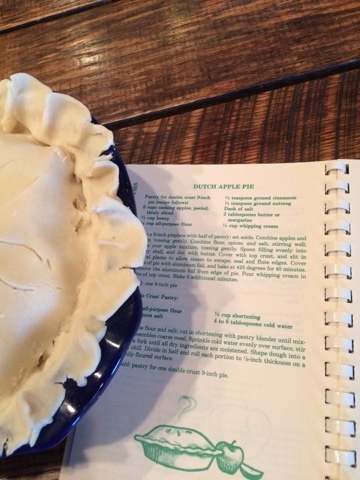 I have an OLD cookbook from the Apple Barn in Pigeon Forge. Soooooo many different recipes with apples. It's a great little book. (I don't know if it is in print any longer, but here it is on Amazon for a penny plus shipping! Combine flour and salt; cut in shortening until mixture resembles coarse meal. Sprinkle in cold water evenly over surface; stir with a fork until all dry ingredients are moistened. Shape dough in a ball; chill. Divide in half and roll each portion to 1/8 inch thickness on a lightly floured surface. 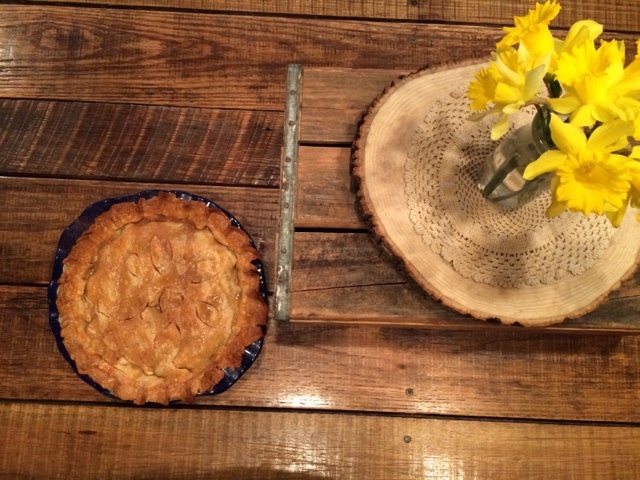 Will make pastry for one double crust 9 inch pie. 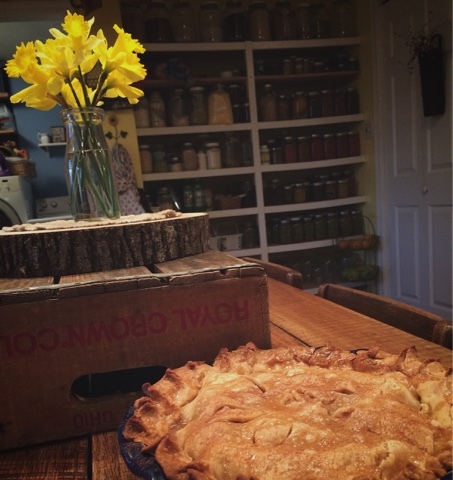 Everyone raved about this pie. 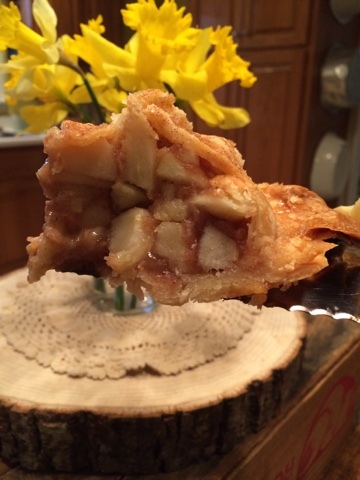 Even my husband who "isn't an apple person" said, "Chas... this pie is delicious! 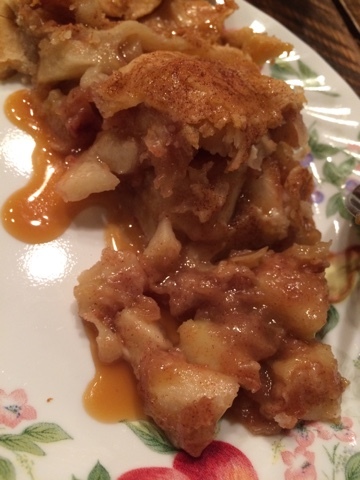 I guess I just thought I wasn't a fan of apple pie!" I have decided that when I can, Saturday's will be a special day when we make dessert. It was a wonderful treat. Pie is good for the heart... I'm sure of it. Making, baking and enjoying. I buy my crusts, but it has to be Pillsbury! I've not seen cream being added to the apple mixture. ...I'd love to taste your pie! Sometimes I buy my crust too. It just depends on if I have enough foresight to make my crust ahead of time. It was a great pie! If I make it again, I will probably try the cream with it just to see how it turns out!